How can diabetes affect the eye? 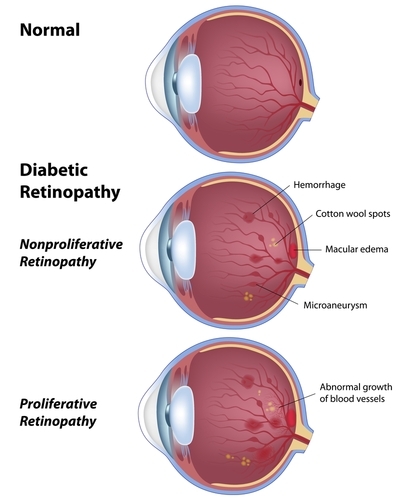 Diabetic Retinopathy (DR) is the most common cause of visual loss in the working age population in UK (fig 1a and 1b). 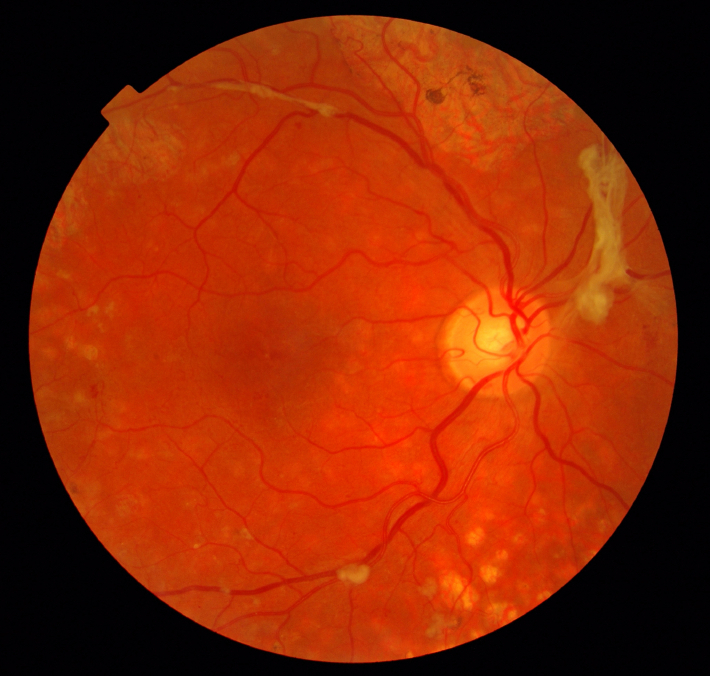 Diabetic macular oedema (DMO) occurs when the fine blood vessels in the retina start to become leaky as a result of damage from diabetes. As a result of the leak, the fluid accumulates in the macula and starts to cause disruption of photoreceptors (fig d5). Diabetes can also cause vision loss through formation of cataract and bleeding inside the jelly (vitreous cavity) of the eye. (fig d3). It is vital that you seek urgent professional advice if you are diabetic and have visual symptoms as some causes can be serious. Duration of diabetes, poor control, uncontrolled hypertension and raised serum lipids, renal failure and pregnancy are just some factors which may speed up the onset of DR and so the patient can themselves help to minimise occurrence of DR by ensuring that the factors mentioned above are controlled by consulting appropriate healthcare professionals. How do I know if I have diabetic eye disease? Patients with DMO will note gradual blurring of vision and distortion for far and near vision. The vision loss is painless and constant and unless treated symptoms will worsen. When the condition progresses, new abnormal blood vessels can develop in the retina which can cause bleeding in the jelly of the eye significantly reducing vision. Patients may note sudden rush floaters if this complication occurs. Urgent treatment will be required to manage this complication. The list of these symptoms are not exhaustive and if you are concerned you must consult a healthcare professional. Intravitreal anti VEGF: Lucentis, Avastin and Eylea injections are the main pharamacotheraputic agents used to manage DMO. These drugs are injected in to the vitreous cavity. Lucentis and Eylea are approved for patients diagnosed with DMO on the NHS. However NICE has placed 400um of central oedema as a precondition for treatment. This is nearly twice the normal amount of macula thickness and undoubtedly there will be patients who will benefit from this treatment but sadly NHS will not provide cover for them. These patients may decide to have laser or IVTA (see below) if this is appropriate or fund the anti VEGF treatment themselves. Avastin (off label and off license) is a more cost effective alternative to lucentis and there is ample evidence for its effectiveness in patients with diabetic macular oedema. Both Lucentis and Avastin have a good chance of improving vision (up to 45%) unlike laser which tends to stabilize vision in general. These injections are given monthly and usually are repeated to control the disease as the condition cannot be cured. The frequency of injections will vary between cases and will also depend on severity of the presenting condition. However the studies indicate that with time the need for injections is significantly reduced especially after the first year of treatment. 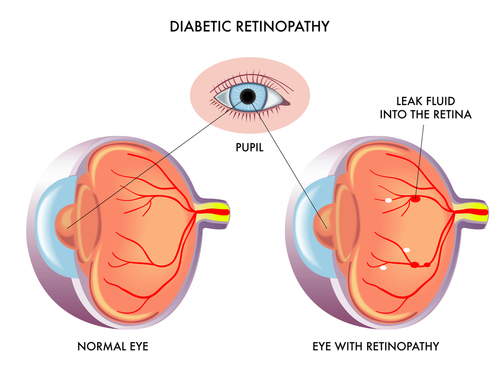 Controlling your diabetes, hypertension and cholesterol are all vital in managing diabetic retinopathy. The treatments mentioned here should be used in adjunct in ensuring that your general medical conditions are also optimised. Laser: Macular laser was the first line of treatment for DMO (Fig D1) prior to arrival of anti VEGF injections and is the first choice if the retinal thickness is less than 400um, as this is a precondition for patients accessing anti VEGF on NHS. 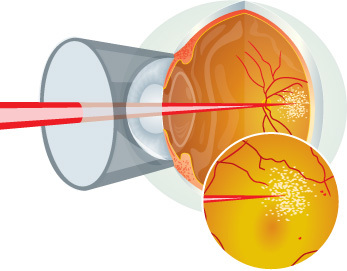 Macular laser helps to reduce macula fluid though it can cause damage to the retinal tissue. Macular laser may also not be possible if DMO involves the very centre of macula.. Laser mainly stabilizes vision by preventing further vision decline. It often will not improve vision. We have seen decline in use of macula laser since advent of anti VEGF injections. Ozurdex implant: has now received NICE approval to be used in patients with DMO with central thickness of 400um and if the patient has had previous cataract surgery and if they are not responding to anti VEGF therapy such as Lucentis or Eylea. One advantage of ozurdex is reducing frequency of your appointments as the effect of one implant can last between 4-6 months. Mr Kashani can discuss with you in detail if this is the suitable agent to treat macula odema. Intravitreal Triamcelenone (IVTA): injection of unpurified steroid in to the globe could be an option if the patient has laser resistant DMO and is losing vision. IVTA is off license and off label and carries many side effects including cataract formation and raised eye pressure sometimes even causing glaucoma. These side effects could offset any potential gain from its use though the advantage of this mode of therapy is it can be offered through the NHS and may be of potential value in those who have had cataract surgery. What should I expect after an injection? Patients can expect some discomfort once the aneastethic has worn off later. I advise on using paracetamol to minimize the discomfort. Lubricating eye drops can also help in particular in those whom have had repeated injections over time as the cornea becomes more ‘sensitive’ to treatment. Occasionally the pain can be more severe and this may indicate a corneal abrasion. The watery and painful eye should settle by the morning. You must inform us if the pain and redness persists, you become photosensitive or if the vision starts to decline. Floaters can also be present and represent air bubbles which disappear within 48 hours. Flashing lights, floaters more than 48 hours and shadow in the vision should prompt you to call us as soon as possible. Sometimes a haemorrhage will appear on the eye ball. 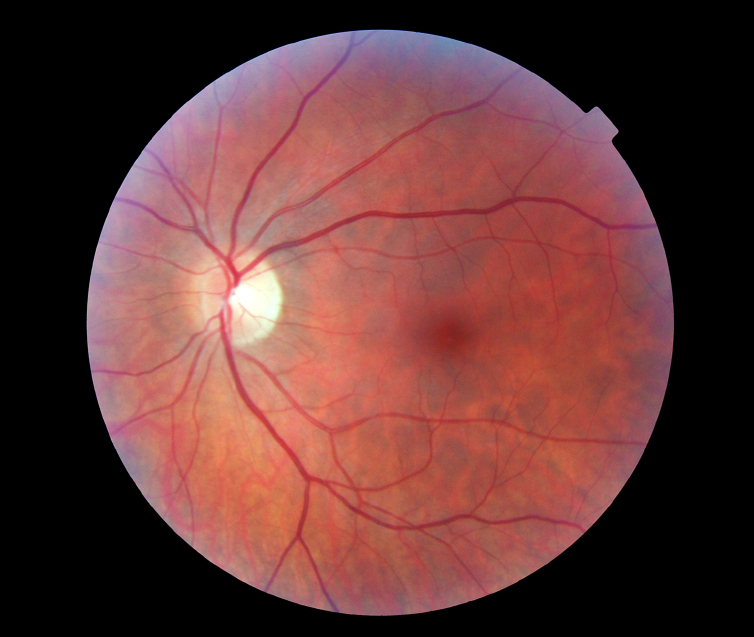 This is a regular occurrence as the eye ball is covered by blood vessels and the needle can nick a blood vessel. The heamorrhage will disappear over next couple of weeks but note it should not be associated with vision loss, pain or general redness of the eye. Take home message is if in doubt please call in and get your symptom checked. What are the risks with injection treatment? Like any medical procedure there is a small risk of a complication from Anti VEGF injections.. Here I have listed the main complications from the procedure, although it must be emphasised that such events are unusual and permanent loss of vision as a result of the injection is very rare. What is the difference between anti VEGF injection like Lucentis and an Ozurdex implant? There are currently no head to head published trials comparing efficacy and safety of anti VEGF agents to Ozurdex implant, though studies are underway looking at this very issue. The choice of the agent should ideally be tailored according to the needs of the patient, though often many other factors are involved in making this choice. Ozurdex has the advantage that the treatment is delivered at longer period of time, reducing burden of disease on patients and clinicians alike. However as Ozurdex is an implant, it is delivered through a thicker needle compared to Anti VEGF agents (Lucentis, Avastin). The Ozurdex implant is therefore more of a traumatic procedure to the eye. Furthermore with repeated implants there is a significant risk of cataract formation which may or may not be bothersome to the patient. Finally eye pressure can increase with these implants and they are not treatment of choice in patients with pre existing eye pressure problems such as glaucoma. Can I have cataract surgery if I have diabetic eye disease? Yes you can however like other retinal conditions affecting the retina, the timing has to be right and Mr Kashani can discuss this with you when surgery is planned. What are the advantages of private treatment? In a small group of patients, DMO can cause visual symptoms before the central retinal thickness reaches 400um. If the odema is central, laser may not be effective either. Anti VEGF therapies have shown to be effective in this subgroup (less than 400um) as well though sadly they don’t have access to treatment until the fluid increases. Of course it is up to the patient whether to observe or fund the treatment themselves to prevent progression. Mr Kashani can go through all the pros and cons of treatment at this point. Most insurance companies, if you are insured will fund the treatment to a certain point depending on your level of cover and thankfully in most cases we can treat sub 400um if treatment is deemed beneficial by the clinician.